A painting of Nichiren, above his image hangs his mantra Nam Myōhō Renge Kyō. Nichiren (日蓮; 16 February 1222 – 13 October 1282), born as Zennichimaro (善日麿), was a Japanese Buddhist priest who lived during the Kamakura period (1185–1333). Nichiren is known for his sole devotion to the Lotus Sutra, asserting that it was Shakyamuni Buddha's ultimate teachings and was the exclusive method to attain enlightenment. Nichiren believed that the Lotus Sutra contained the essence of all of Shakyamuni Buddha's teachings related to the laws of causality, karma, without any distinction to enlightenment. His interpretation of the Lotus Sutra centers on the emphasis of its 16th chapter, The Life Span of the Thus Come One, where he grounds his revelation that the chanting of Nam Myōhō Renge Kyō is the superior practice of Mappō or today's age. Nichiren further justifies this practice of chanting Nam Myōhō Renge Kyō by attributing the natural and social calamities of his time to the inability of the Pure Land, Zen, Shingon, Ritsu, and Tendai schools to divinely protect Japan. Nichiren gained the attention of Japan's ruling Hōjō clan when his two Lotus Sutra-based predictions of foreign invasion and political strife were seemingly actualized by the Mongol invasions of Japan and an attempted coup within the Hōjō clan. The religious remonstration where he stated these two predictions, titled the Risshō Ankoku Ron (立正安国論) (On Establishing the Correct Teaching for the Security of the Land), considered by Japanese historians to be a literary classic illustrating the apprehensions of that period. While all Nichiren Buddhist schools regard him as a reincarnation of the Lotus Sutra's Visistacaritra or Jōgyō Bosatsu (上行菩薩), some schools of Nichiren Buddhism's Nikkō lineages regard him as the Buddha of the Latter day of the Law and for all eternity. Today, Nichiren Buddhism includes traditional schools such as Nichiren Shōshū, the Nichiren Shū confederation of schools, and modern lay movements such Kenshokai, Shoshinkai, Soka Gakkai, Risshō Kōsei Kai, and Honmon Butsuryū Shū each claiming their own interpretations of Nichiren's teachings. The fundamental practice shared by all of them is the chanting of Nam Myōhō Renge Kyō. Nichiren was born on 16 February 1222 in the village of Kominato (today part of the city of Kamogawa), Nagase District, Awa Province (within present-day Chiba Prefecture). Nichiren's father, a fisherman, was Mikuni-no-Tayu Shigetada, also known as Nukina Shigetada Jiro (d. 1258) and his mother was Umegiku-nyo (d. 1267). On his birth, his parents named him Zennichimaro (善日麿) which has variously been translated into English as "Splendid Sun" and "Virtuous Sun Boy" among others. The exact site of Nichiren's birth is believed to be submerged off the shore from present-day Kominato-zan Tanjō-ji (小湊山　誕生寺), a temple in Kominato that commemorates Nichiren's birth. In his own words, Nichiren stated that he was "the son of a chandala family who lived near the sea in Tojo in Awa Province, in the remote countryside of the eastern part of Japan." Determined to plant a seed of Buddhahood and attain Buddhahood in this life, just as all other people, I relied on Amida Buddha and chanted the name of this Buddha since childhood. However, I began doubting this practice, making a vow to study all the Buddhist sutras, commentaries on them by Bodhisattvas, and explanatory notes by others. Nichiren began his Buddhist study at a nearby temple of the Tendai school, Seichō-ji (清澄寺, also called Kiyosumi-dera), at age 11. He was formally ordained at 16 and took the Buddhist name Zeshō-bō Renchō (是聖房蓮長) where Renchō means "Lotus Growth". He left Seichō-ji shortly thereafter to study in Kamakura and several years later traveled to western Japan for more in-depth study in the Kyoto–Nara area, where Japan's major centers of Buddhist learning were located. In 1233 he went to Kamakura, where he studied Pure Land Buddhism, a pietistic school that stressed salvation through the invocation of Amitābha (Japanese Amida), the Buddha of infinite compassion, under the guidance of a renowned master. After having persuaded himself that devotion to Amitabha Buddha was not the true Buddhist doctrine, he passed to the study of Zen, which had become popular in Kamakura and Kyōto. He then went to Mount Hiei, the cradle of Tendai, where he felt the original purity of the Tendai doctrine corrupted by the introduction and acceptance of other doctrines, especially Amidism and esoteric Buddhism. To eliminate any possible doubts, Nichiren decided to spend some time at Mount Kōya, the centre of Shingon Buddhism, and also in Nara, Japan's ancient capital, where he studied the Risshū, which emphasized strict adherence to the Vinaya, the code of monastic discipline and ordination. During this time, he became convinced of the pre-eminence of the Lotus Sutra and in 1253, returned to Seichō-ji. On April 28, 1253, he expounded the daimoku teachings for the first time, marking his Sho Tempōrin (初転法輪: "first turning the wheel of the Law"). With this, he proclaimed that devotion and practice based on the Lotus Sutra was the correct form of Buddhism for the current time. At the same time he changed his name to Nichiren, nichi (日) meaning "sun" and ren (蓮) meaning "lotus". This choice, as Nichiren himself explained, was rooted in passages from the Lotus Sutra. 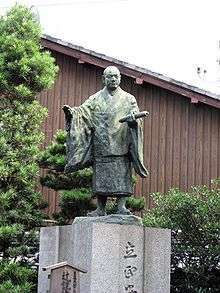 After making his declaration, which all schools of Nichiren Buddhism regard as marking their foundation (立宗: risshū), Nichiren began propagating his teachings in Kamakura, then Japan's de facto capital since it was where the shikken or regent for the shogun and the shogun himself lived and the government was established. He gained a fairly large following there, consisting of both priests and laity. Many of his lay believers came from among the samurai class. It is claimed that in 1253 Nichiren predicted the Mongol invasions of Japan: a prediction which was validated in 1274. Nichiren viewed his teachings as a method of efficaciously preventing this and other disasters: that the best countermeasure against the degeneracy of the times and its associated disasters was through the activation of Buddha-nature by chanting and the other practices which he advocated. When Nichiren is exiled in 1261, Nichirō wants to follow Nichiren; but Nichirō is forbidden to do so -- Postcard artwork, circa 1920s. Nichiren then engaged in writing, publishing various works including his Risshō Ankoku Ron (立正安国論): "Treatise On Establishing the Correct Teaching for the Peace of the Land",[note 1] his first major treatise and the first of three remonstrations with government authorities. He felt that it was imperative for the sovereign to recognize and accept the singly true and correct form of Buddhism (i.e., 立正: risshō) as the only way to achieve peace and prosperity for the land and its people and end their suffering (i.e., 安国: ankoku). This "true and correct form of Buddhism", as Nichiren saw it, entailed regarding the Lotus Sutra as the fullest expression of the Buddha's teachings and putting those teachings into practice. Nichiren thought this could be achieved in Japan by withdrawing lay support so that the deviant monks would be forced to change their ways or revert to laymen to prevent starving. Based on prophecies made in several sutras, Nichiren attributed the occurrence of the famines, disease, and natural disasters (especially drought, typhoons, and earthquakes) of his day to teachings of Buddhism no longer appropriate for the time. Nichiren submitted his treatise in July 1260. Though it drew no official response, it prompted a severe backlash, especially from among priests of other Buddhist schools. Nichiren was harassed frequently, several times with force, and often had to change dwellings. Nichiren was exiled to the Izu Peninsula in 1261, and pardoned in 1263. He was ambushed and nearly killed at Komatsubara in Awa Province in November 1264 by forces led by Lord Tōjō Kagenobu. The following several years were marked by successful propagation activities in eastern Japan that generated more resentment among rival priests and government authorities. After one exchange with the influential priest, Ryōkan (良観), Nichiren was summoned for questioning by the authorities in September 1271. He used this as an opportunity to make his second government remonstration, this time to Hei no Saemon (平の左衛門, also called 平頼綱: Taira no Yoritsuna), a powerful police and military figure who issued the summons. Two days later, on September 12, Hei no Saemon and a group of soldiers abducted Nichiren from his hut at Matsubagayatsu, Kamakura. Their intent was to arrest and behead him. According to Nichiren's account, an astronomical phenomenon — "a brilliant orb as bright as the moon" — over the seaside Tatsunokuchi execution grounds terrified Nichiren's executioners into inaction. The incident is known as the Tatsunokuchi Persecution and regarded as a turning point in Nichiren's lifetime called Hosshaku kenpon (発迹顕本), translated as "casting off the transient and revealing the true," or "Outgrowing the provisional and revealing the essential". 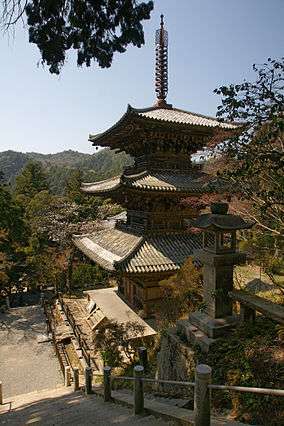 Konpon Temple was built on Sado where Nichiren lived during his exile. Unsure of what to do with Nichiren, Hei no Saemon decided to banish him to Sado, an island in the Sea of Japan known for its particularly severe winters and a place of harsh exile. This exile, Nichiren's second, lasted about three years and, though harsh and in the long term detrimental to his health, represents one of the most important and productive segments of his life. While on Sado, he won many devoted converts and wrote two of his most important doctrinal treatises, the Kaimoku Shō (開目抄: "On the Opening of the Eyes") and the Kanjin no Honzon Shō (観心本尊抄: "The Object of Devotion for Observing the Mind") as well as numerous letters and minor treatises whose content containing critical components of his teaching. During his 1272 exile on Sado Nichiren inscribed the first Gohonzon (御本尊). It is believed, especially in Nichiren Shoshu, that on October 12, 1279 he inscribed the Dai Gohonzon for all humanity. In addition, more than a hundred Gohonzon images preserved today are attributed to Nichiren, of which several are prominently retained by the Mount Minobu Sect also known as Nichiren Shu. The Dai-Gohonzon mandala is enshrined at the Tahō Fuji Dainichirenge-zan Taiseki-ji, informally known as the Head Temple Taiseki-ji of the Nichiren Shōshū Order of Buddhism. It is located at the foot of Mount Fuji in Fujinomiya, Shizuoka Prefecture, Japan. Nichiren was pardoned in February 1274 and returned to Kamakura in late March. He was again interviewed by Hei no Saemon, who now was interested in Nichiren's prediction of an invasion by the Mongols. Mongol messengers demanding Japan's fealty had frightened the authorities into believing that Nichiren's prophecy of foreign invasion would materialize (which it later did in October of that year; see Mongol invasions of Japan). Nichiren, however, used the audience as yet another opportunity to remonstrate with the government. With the exception of a few short journeys, Nichiren spent the rest of his life at Minobu, where he and his disciples erected a temple, Kuon-ji (久遠寺), and he continued writing and training his disciples. Two of his works from this period are the Senji Shō (撰時抄: "The Selection of the Time") and the Hōon Shō (報恩抄: "On Repaying Debts of Gratitude"), which, along with his Risshō Ankoku Ron (立正安国論: "On Establishing the Correct Teaching for the Peace of the Land"), Kaimoku Shō ("The Opening of the Eyes"), and Kanjin no Honzon Shō ("The Object of Devotion for Observing the Mind"), constitute his Five Major Writings. He also inscribed numerous Gohonzon for bestowal upon specific disciples and lay believers. Many of these survive today in the repositories of Nichiren temples such as Taiseki-ji (大石寺) in Fujinomiya, Shizuoka, which has a particularly large collection of scrolls that is publicly aired once a year, along with the dusting of the Dai-Gohonzon (O-mushibarai ceremony) by the High Priest of Nichiren Shoshu in April. Nichiren spent his final years writing, inscribing Gohonzon for his disciples and believers, and delivering sermons. In failing health, he was encouraged to travel to hot springs for their medicinal benefits. He left Minobu in the company of several disciples on September 8, 1282. He arrived ten days later at the residence of Ikegami Munenaka, a lay believer who lived in what is now Ikegami Honmon-ji. On September 25 he delivered his last sermon on the Risshō Ankoku Ron, and on October 8 he appointed six senior disciples—Nisshō (日昭), Nichirō (日朗), Nikkō (日興), Nikō (日向), Nichiji (日持), and Nitchō (日頂)—to continue leading propagation of his teachings after his death. Due to the arising doctrinal conflicts which transpired after his death, Nichiren Shōshū believes that Nichiren designated five senior priests and one successor, Nikko. The Kamakura period of 13th century Japan, in which Nichiren was born - was characterised by natural disasters, internal strife and confusion within Mahayana schools about whether: "...the world had further entered a period of decline" referring to the Latter Day of the Law. Nichiren attributed the turmoil in society to the invalid teachings of the Buddhist schools of his time, including the Tendai sect in which he was ordained: "It is better to be a leper who chants Nam-myōhō-renge-kyō than be a chief abbot of the Tendai school". Examinations of such breaks and continuities have been useful in illuminating the sources of Nichiren's ideas and to what extent Nichiren's thought is original or derivative of his parent tradition. 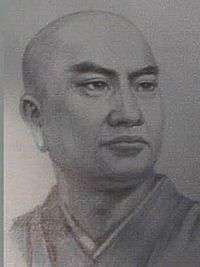 Setting out to declare his own teachings of Buddhism, Nichiren started at the age of 32 by denouncing all Mahayana schools of his time and by declaring the correct teaching as the Universal Dharma (Namu-Myōhō-Renge-Kyō) and chanting as the only path for personal and social salvation. At the age of 51, Nichiren inscribed the Object of Veneration in Buddhism, the Gohonzon,"never before known" as he described it. 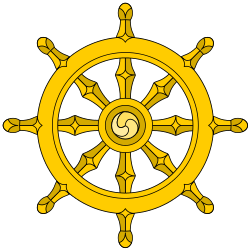 Other contributions to Buddhism were the teaching of The Five Guides of Propagation, The doctrine of the Three Great Secret Dharmas and the teaching of The Three Proofs for verification of the validity of Buddhist doctrines. There is a difference between Nichiren teachings and almost all schools of Mahayana Buddhism regarding the understanding of the Latter day of the Law, Mappō. Nichiren believed that the teachings of the Lotus Sutra will flourish for all eternity, and that the Bodhisattvas of the Earth will propagate Buddhism in the future. Nichiren criticized other Buddhist schools for their manipulations of the populace for political and religious control. Citing Buddhist sutras and commentaries, Nichiren argued that these schools were distorting the Buddhist teachings for their own gain. Nichiren stated his criticism clearly, in his Risshō Ankoku Ron (立正安国論): "Treatise On Establishing the Correct Teaching for the Peace of the Land",[note 3] his first major treatise and the first of three remonstrations with government authorities. After Nichiren's death, his teachings were interpreted in different ways. As a result, Nichiren Buddhism encompasses several major branches and schools, each with its own doctrine and set of interpretations of Nichiren's teachings. Some Nichiren schools refer to the entirety of Nichiren's Buddhism as his "lifetime of teaching". Many of his writings still exist in his original hand, some as complete writings and some as fragments. Others survive as copies made by his immediate disciples. His existing works number over 700, including transcriptions of orally delivered lectures, letters of remonstration and illustrations. Today's Nichiren schools can not agree however, which of his writings can be deemed authentic and which are apocryphal. Nichiren declared that women could attain enlightenment, therefore a great number of letters were addressed to female believers. Some schools within Nichiren Buddhism consider this to be a unique feature of Nichiren's teachings and have published separate volumes of those writings. In addition to treatises written in kanbun (漢文), a formal writing style modeled on classical Chinese that was the language of government and learning in contemporary Japan, Nichiren also wrote expositories and letters to disciples and lay followers in mixed-kanji–kana vernacular as well as letters in simple kana for believers who could not read the more-formal styles, particularly children. He is also known for his "kanbun", many of his writings preserved in the libraries of the empire had been lost at the end of the Boshin War. Some of Nichiren's kanbun works, especially the Risshō Ankoku Ron, are considered exemplary of the kanbun style, while many of his letters show unusual empathy and understanding for the down-trodden of his day. Many of his most famous letters were to women believers, whom he often complimented for their in-depth questions about Buddhism while encouraging them in their efforts to attain enlightenment in this lifetime. On Establishing the Correct teaching for the Peace of the Land (Rissho Ankoku Ron) - written between 1258-1260 CE. The Opening of the Eyes (Kaimoku-sho) - written in 1272 CE. The Object of Devotion for Observing the Mind (Kanjin-no Honzon-sho) - written in 1273 CE. The Selection of the Time (Senji-sho) - written in 1275 CE. On Repaying Debts of Gratitude (Ho'on-sho) - written in 1276 CE. On Chanting the Daimoku of the Lotus Sutra (Sho-hokke Daimoku-sho) - Written in 1260 CE. On Taking the Essence of the Lotus Sutra (Hokke Shuyo-sho) - written in 1274 CE. On the Four Stages of Faith and the Five Stages of Practice (Shishin Gohon-sho) - written in 1277 CE. Letter to Shimoyama (Shimoyama Gosho-soku) - written in 1277 CE. Questions and Answers on the Object of Devotion (Honzon Mondo-sho) - written in 1278 CE. In his writings, Nichiren refers to his identity in a variety of ways, nevertheless always related to the Lotus Sutra. For example: "I, Nichiren, am the foremost votary of the Lotus Sutra". Nichiren believed his proselytisation had fulfilled the vows the bodhisattva Viśiṣṭacāritra (Jōgyō (上行)) gave in the Lotus Sutra; Nichiren Shū understands that Nichiren was thus Jōgyō's reincarnation. After his death, Nichiren has been known by several posthumous names intended to express respect toward him or to represent his position in the history of Buddhism. Most common among these are Shōnin 聖人 "saint, sage" and Daishōnin "大聖人" "great sage". "Shōnin" is commonly used within Nichiren Shū. "Daishōnin" is the title used by followers of most, but not all, of the schools and temples derived from the Nikkō lineage, most notably Nichiren Shōshū and Soka Gakkai, who regard Nichiren as the Buddha of the Latter Day of the Law. ↑ Also translated as "On Establishing the Correct Teaching for the Peace of the Land" (The Writings of Nichiren Daishonin), "Establishment of the Legitimate Teaching for the Protection of the Country" (Selected Writings of Nichiren). ↑ Also translated as "On Establishing the Correct Teaching for the Peace of the Land" (The Writings of Nichiren Daishonin), "Establishment of the Legitimate Teaching for the Protection of the Country" (Selected Writings of Nichiren), and others. ↑ Ryuei Michael McCormick. "Nichiren Shonin (1222-1282)". San Jose Sangha. 1 2 "Nichiren Buddhism". About.com. Retrieved 2012-09-21. ↑ Entry: "Superior Practices" The Soka Gakkai Dictionary of Buddhism, 2002. ↑ "The Writings of Nichiren Daishonin I, SGI 2006 pp, 202: Banishment to Sado". Sgilibrary.org. Retrieved 2013-09-06. ↑ Hori, Kyotsu (1995). Nyonin Gosho: Letters Addressed to Female Followers. Nichiren-shu Overseas Propagation Promotion Association. p. 182. 1 2 Murano, Senchu (2003). Two Nichiren Texts (PDF). Berkeley, CA: Numata Center for Buddhist Translation and Research. pp. 9–52. ISBN 1886439176. 1 2 "The Writings of Nichiren Daishonin I, SGI 2006 pp, 6-32: On Establishing the Correct Teaching for the Peace of the Land". Sgilibrary.org. Retrieved 2013-09-06. ↑ "The Writings of Nichiren Daishonin I, SGI 2006, pp. 220-298: The Opening of the Eyes". Sgilibrary.org. Retrieved 2013-09-06. ↑ "The Writings of Nichiren Daishonin I, SGI 2006, pp. 354-382: The Object of Devotion for Observing the Mind". Sgilibrary.org. Retrieved 2013-09-06. ↑ "The Writings of Nichiren Daishonin I, SGI 2006, pp. 538-594: The Selection of the Time". Sgilibrary.org. Retrieved 2013-09-06. ↑ "SGI The Writings of Nichiren Daishonin I, SGI 2006, pp. 41-47: The Four Debts of Gratitude". Sgilibrary.org. Retrieved 2013-09-06. ↑ "The Writings of Nichiren Daishonin I, SGI 2006, pp. 3-5: On Attaining Buddhahood in This Lifetime". Sgilibrary.org. Retrieved 2013-09-06. ↑ "The Writings of Nichiren Daishonin I, SGI 2006, p. 832: The Real Aspect of the Gohonzon". Sgilibrary.org. Retrieved 2013-09-06. ↑ "The Writings of Nichiren Daishonin I, SGI 2006, p. 77: Encouragement of a Sick Person". Sgilibrary.org. Retrieved 2013-09-06. ↑ "The Soka Gakkai Dictionary of Buddhism 2002: Three proofs". Sgilibrary.org. Retrieved 2013-09-06. ↑ Asai Endō (1968; translated 1999). Nichiren Shonin's View of Humanity: The Final Dharma Age and the Three Thousand Realms in One Thought-Moment, Japanese Journal of Religious Studies 26 (3-4), 239-240. See also "The Writings of Nichiren Daishonin I, SGI 2006, p. 437 Rebuking Slander of the Law". Sgilibrary.org. Retrieved 2013-09-06. , "The Writings of Nichiren Daishonin I, SGI 2006, p. 736: On Repaying Depts of Gratitude". Sgilibrary.org. Retrieved 2013-09-06. and "The Writings of Nichiren Daishonin I, SGI 2006, p. 903: The Teaching for the Latter Day". Sgilibrary.org. Retrieved 2013-09-06. .
↑ "Living Rissho Ankoku Ron Commentary by Rev. Ryuei". Nichirenscoffeehouse.net. Retrieved 2013-09-06. ↑ Kurihara, Toshie. 2003. "A History of Women in Japanese Buddhism: Nichiren's Perspectives on the Enlightenment of Women." The Journal of Oriental Studies, vol. 13. p.94 Archived March 14, 2012, at the Wayback Machine. ↑ Oguri, Junko. 1987. Nyonin ojo: Nihon-shi ni miru onna no sukui (Women's Capacity to Be Reborn in the Pure Land: Women's Salvation in Japanese History). Jimbun Shoin, p. 122. See also: Oguri, Junko. 1984. "Views on Women's Salvation in Japanese Buddhism" in Young East 10/1, pp 3-11. ↑ Soka Gakkai Dictionary of Buddhism, Soka Gakkai, "Five Major Writings"
↑ Dharma Flower, Ryuei Shonin (Michael McCormick) 2000, p. 156: "The five most important works of Nichiren Shonin. The five major writings are: Rissho ankoku ron (Treatise on Spreading Peace Throughout the Country by Establishing the True Dharma), Kaimoku sho (Open Your Eyes), Kanjin no honzon sho (Spiritual Contemplation and the Focus of Devotion), Senji sho (Selecting the Right Time), and Ho'on sho (Recompense of Indebtedness)." 1 2 Soka Gakkai Dictionary of Buddhism, Soka Gakkai, "Ten Major Writings". ↑ Soka Gakkai Dictionary of Buddhism, Soka Gakkai, "Rissho Ankoku Ron". ↑ "The Writings of Nichiren Daishonin I, SGI 2006, pp. 552: The Selection of the Time". Sgilibrary.org. Retrieved 2013-09-06. ↑ Jaffe, Paul D. "Rising from the Lotus: Two Bodhisattvas from the Lotus Sutra as a psychodynamic paradigm for Nichiren". Japanese Journal of Religious Studies. 13 (1): 85–86. JSTOR 30233362. Montgomery, Daniel B. (1991). Fire in the lotus: the dynamic Buddhism of Nichiren. London: Mandala. ISBN 978-1852740917. Stone, Jacqueline Ilyse (1 May 2003). Original Enlightenment and the Transformation of Medieval Japanese Buddhism. University of Hawaii Press. ISBN 978-0-8248-2771-7. Nichiren Shoshu International Center (1983). A Dictionary of Buddhist terms and concepts. (1st ed.). Tokyo: Nichiren Shoshu International Center. ISBN 978-4888720144. Causton, Richard (1985). Buddha in Daily Life: An Introduction to the Buddhism of Nichiren Daishonin. Random House. Christensen, J. A. (2000). Nichiren. Fremont, CA: Jain Publishing Co. ISBN 978-0875730868. Harvey, Peter (1992). An introduction to Buddhism : teaching, history and practices (Repr. ed.). Cambridge [u.a. ]: Cambridge Univ. Press. ISBN 978-0521313339. Tamura, Yoshiro (2000). 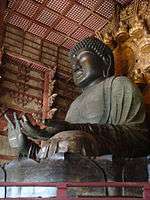 Japanese Buddhism : a cultural history (1. Engl. ed.). Tokyo: Kosei Publ. ISBN 978-4333016846. Tanabe, George, ed. (2002). Writings of Nichiren Shōnin. Tokyo: Nichiren Shū overseas propagation promotion association. ISBN 978-0824825515. Nichiren Buddhist Temple of San Jose (1957). Lotus seeds: The Essence of Nichiren Shu Buddhism. San Jose, CA: Nichiren Buddhist Temple of San Jose. ISBN 978-0970592002. The Major Writings of Nichiren Daishonin (WND). Soka Gakkai, Tokyo, 1999. Wikimedia Commons has media related to Nichiren. Nichiren - a Man of Many Miracles (日蓮と蒙古大襲来 Nichiren to mōko daishūrai) - 1958 film by Kunio Watanabe.